Step 1 – Check Your History: We begin with a series of questions about how often the guest shampoos and conditions their hair and which products they use. Next, we check to see if they feel they’re actively losing their hair and if any family members have similar problems. Step 2 – Check Important Scalp Values: With the assistance of three special, noninvasive probes, we test for the scalp’s oil level, hydration, and pH. The combination of this data guides us in the direction toward a custom treatment plan for our guest. Step 3 – Physical Scalp & Hair Check-Up: We perform a physical evaluation of the scalp to check its pliability (how much movement the scalp has) to determine if conditions are optimal for the hair growth cycle. We also examine the scalp for redness, dandruff and hair elasticity, moisture level, thickness and breakage potential. 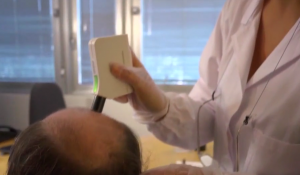 Step 4 – Scope the Scalp & Hair: A specialized video scope with three different lens magnifications allows our certified Trichologist, and you, to view your scalp on a large screen, in order to help further identify problems and create a benchmark that we can review after hair loss treatment begins. Once the four-step process of the ScalpCheck® is completed, all the data is entered into the Cesare Ragazzi proprietary TricoTest® software that provides the proper scalp and hair treatment protocol for that guest, based on their individual scalp and hair needs. Once finished, the guest is given a specific custom hair loss treatment protocol that includes a combination of in-center and at-home scalp treatments. At the end of the average two or three-month treatment protocol period, the guest returns to get their hair and scalp reassessed to determine what, if any, further courses of action are needed. If you are suffering from hair thinning and loss, visit a Trichology specialist. Instead of diagnosing yourself, which can lead to even more problems, get a thorough analysis of your oil, dandruff, and hair loss levels. The scalp needs the same amount of care as the face, according to Paul, and when visiting with a Trichologist, you will learn how to exfoliate, how to clean it, and how to use products correctly and consistently to help correct the problem and avoid further damage.